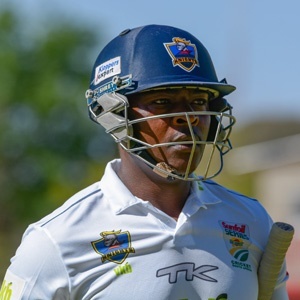 Cape Town - A maiden century from Grant Mokoena was one of the main highlights on the final day of the Sunfoil Series drawn clash between the Knights and the Warriors at the Diamond Oval in Kimberley on Thursday. The right-handed opener top-scored with 108 (169 balls, 15 fours) and received fine support from Keegan Petersen, who made 103 (213 balls, 13 fours) as the hosts finished the game on 391 for five in reply to the visitors' 362 all out. Only one innings was possible per side after just 40 overs were possible on the first day because of rain and a wet outfield, while the entire day two had to be abandoned due to the weather damage. The home side resumed the final day knowing their batsmen were getting in some overs under the belt when they resumed on 168 for one. Mokoena went on to better his previous best score of 75 in the competition with a second first-class ton, while Petersen's effort was the 10th century of his career. Rudi Second was the next best scorer with 40, while Ryan McLaren hit an unbeaten 36. Sisanda Magala (2/64) and Simon Harmer (2/118) picked up two wickets each.